The fertile Italian province of Emilia-Romagna is the birthplace of Parmesan cheese and Lambrusco wine. And in the city of Modena this province invented balsamic vinegar. It was there that on October 12, 1935, Luciano Pavarotti was born. His father worked as a baker, but he really wanted to become an operatic tenor. The singing baker was a celebrity of Modena. He sang in the church choir and in the opera. Fernando had a great voice, and he could easily have become a singer, but he didn’t have the courage – for fear of the scene, the man remained in the bakery. Pavarotti’s mother, Adele, was proud of her husband and first-born. Luciano grew up in the nursery of the tobacco factory where his mother worked. Luciano’s peaceful childhood overshadowed the shadow of war. The Italiancaster Luciano Pavarotti the Nazis fought on the side of the Nazis, but the province of Emilia-Romagna remained a stronghold of the partisans. They defeated the fascists, but the Germans still came to this land. Then Luciano was 8 years old. In 1945, the inhabitants of Modena met the Americans, who became for them a symbol of liberation after two years of occupation and terror. These years influenced Luciano. Already being a star, he always opposed war. The first performance of Luciano took place when he was 4 years old. He sang “The heart of beautiful women is prone to treason.” The audience, consisting of grandmothers, aunts and mothers, was simply fascinated. Later in the house of one of the friends, the yard guys held singing contests in which Luciano became the constant winner. singer Luciano Pavarotti He always wanted to be the first in everything – whether it be a game of football, cycling or running a race. Sometimes he helped his friends to enchant the girls by singing serenades under the windows. They stood near the house and opened their mouths, imitating singing, and Luciano in the arch gave out excellent play. Pavarotti met his love at a party. To make an impression, Luciano sang the love song “Swallow’s Nest”. Subsequently, he admired this song with millions of listeners. But then in 1952, he sang only for her – 16-year-old Adua. The girl studied better, and they started to study together, they saw each other every day. The school still tells this romantic story about them. Love survived the school season, and in 1955 their engagement took place, which proved to be long. Both of them worked as teachers – Luciano taught physical education, worked as an insurance agent, and at the same time took singing lessons from Arrigo Polo. When the teacher left for Japan, he agreed with Luciano to study another maestro, Ettori Campogalliani. Pavarotti together with her childhood friend Mirella Freni (who also became an opera celebrity) traveled to the teacher for tens of kilometers. They succeeded more in singing than in reading notes, but the maestro was in no hurry to re-educate them. He believed that the voices of young people sound so natural that it does not make sense to change it. In 1960, Luciano Pavarotti took part in the competition of the Theater Reggio Emilia. 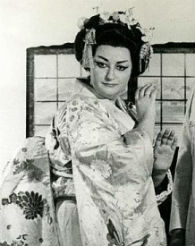 The main prize is the leading role in the new opera. Luciano was sure of his victory. And then something happened that no one could believe. Because of laryngitis, it seemed like he was pulling out notes. 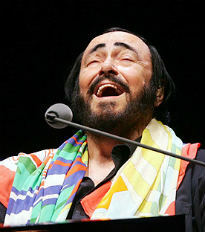 As a result, Pavarotti took second place. For the perfectionist, this was a bitter defeat. A year later, persistent Luciano repeated the attempt and won. He received the role of Rudolph in Puccini’s opera La Boheme. And the role of Mimi was played by his girlfriend Mirella Freni. Finally, Luciano and Adua were able to get married, though the singer’s fee barely covered the cost of the wedding. Adua continued to work as a teacher, because Luciano earned by today’s standards 90 euros for a concert. In October 1962, shortly before the birth of their first child, the turning day came when Luciano did not come home because he and his friends celebrated their success in Rigoletto.